The performance of fusion propulsion systems can be estimated by using the same approach and equations as in Section 7.18. The basic tradeoffs are the same, except power may be scaled up (conceptually, at least) by orders of magnitude. 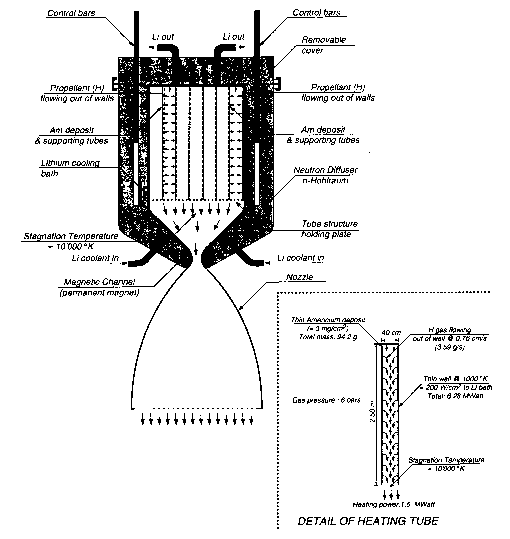 It is also assumed that inert propellant is added to the propulsion system in some way to increase thrust. Spacecraft mass M (or M0) was chosen to be either 1001 or 1,0001 (this latter clearly an upper bound for many decades to come). The analytical solution in Section 7.18 is the result of having assumed (for simplicity) that the propellant mass can be neglected compared with M, and that the trajectories are composed of an accelerated segment to midcourse, followed by deceleration to final destination (the A V for orbit capturing has been neglected in this approach). More general solutions can be found in Ch. 4 of [Stuhlinger, 1964], but not that for constant acceleration which is discussed in Chapter 8 of this book.